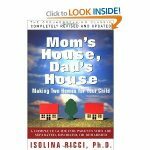 My clear favorite book for parents is “Mom’s House, Dad’s House: Making Two Homes for Your Child” by Isolina Ricci. My only complaint is that this book nearly 400 pages–with small print! But some things are worth carving out time to read, and this book is one of those things. All questions are answered inside those covers–from Parenting Plans to the power of language, to managing emotions and healing wounds to the new “Businesslike relationship, and troubleshooting problems. Read it cover to cover and then refer back to it when things come up. 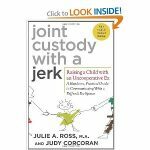 The other book that I sometimes recommend to parents is “Joint Custody with a Jerk: Raising a Child with an Uncooperative Ex”, by Julie A. Ross & Judy Corcoran. “Joint Custody with a Jerk” wins the prize for best book title of all time. In fact, I originally purchased this book solely because of the title, and I bet I’m not the first. But there’s good stuff beyond the cover, too. For example, I like that this book starts by encouraging the reader to examine their own feelings, and identifying a problem other than ‘my ex is a jerk.’ This is the absolute perfect place to start, and a method I use with families myself. They teach a concept they call the “problem pyramid,” and encourage parents to ask themselves 1: what exactly is the problem, 2, who has upset feelings about the issue, 3, who brought up the issue, and 4, who is responsible for the solution? By working through those questions, the authors say that parents will have a healthy, effective guide as to how they should respond–to the jerky ex, their kids, or in any other relationship where conflicts arise.